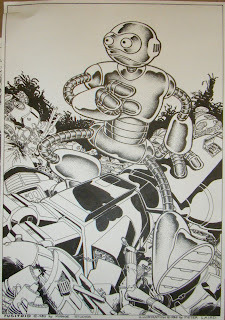 I can't recall if this drawing I did back in 1985 of the Fugitoid running through a robot junkyard was ever printed anywhere. It's possible we used it as a pinup in one of the comics. Wow that's a great piece Pete. I love the Fugitoid. So far I have spotted Robby, C3-PO, R2-D2, and the B-9 Robot from Lost in Space. Did I miss any? Great shadow! He pops right out! Wow that's a great piece Pete. I love the Fugitoid. So far I have spotted Robby, C3-PO, R2-D2, and the B-9 Robot from Lost in Space. Did I miss any?" Did you ever have any aspirations of having the Fugitoid become his own stand alone comic book character? I think there is one more. Is that the Experimental Prototype Robot K1 from Dr Who? DT, .. crap .. maybe he's running out of the bowels of the Sandcrawler !! Thought you may get a kcik out of this: http://www.newsarama.com/film/090226-zack-snyder-watchmen.html, it's an interview with Zack Snyder. In it, he mentions he's a fan of the original TMNT comics. Do you think the chances of Snyder doing a TMNT movie are any good? Oh man Zach would do an amazing job with TMNT. We would finally be able to see a PG-13 or a Rated R Turtles movie. Im geeking out at the thought of it. How many of you guys would like to see that? What do you think Peter? Did you ever have any aspirations of having the Fugitoid become his own stand alone comic book character?" "Is that the Experimental Prototype Robot K1 from Dr Who?" Do you think the chances of Snyder doing a TMNT movie are any good?" Yeah I def would love to see a more mature TMNT film version - perhaps it could even be in black and white and rated R? Now that would be bloody awesome - something totally away from the recent try-hard "gritty" cgi film - though I thought it was okay as I know that children overall are the target audience of our green heroes these days and the recent film could have been much much worse. I just would love to see the threatening element to the turtles back like they originally appeared. I mean I would be terrified seeing humanoid reptiles armed to the teeth with Japanese weapons in a dark alley. Reboot anyone? Stark realism like Dark Knight would def work in the TMNT universe though it's just me that I prefer that to goofy fantasy stories. This drawing was indeed used as a pinup, on the back inside cover of the Fugitoid one-shot, in fact.